My edition: ebook, published on 10th October 2013 by Novelicious Books, 295 pages. Ellie knows that starting a family with lovely husband Pete would be an amazing adventure. Pete would make a brilliant dad and she'd have an excuse to eat shed loads of Cherry Bakewell. But Ellie's bestie would rather she was up at 3am with a bottle of Malibu, not formula. And with redundancies looming, Ellie's boss isn't exactly going to throw her a shower if she disappears for a year, with pay. While Ellie juggles her feelings (and everyone else's) as competently as a drunken clown, she finds herself signing up for a baking class, alongside the young, free and sizzling hot Joe. As they work buns and shape tarts, is there more to their friendship than a shared appreciation of Paul Hollywood? Ellie loves her husband, her life and her job (well, the latter most of the time) and everyone around her tells her she is ready to take the next step in life, that of creating a happy little family with her husband Pete. But she isn't so sure herself. Now in her thirties she's the age that most of her friends and family members start popping out babies left and right and it isn't that she doesn't love her husband (on contrary) or that they aren't financially able to support a little sprog or two, but Ellie simply isn't certain she's emotionally ready and able to take care of anyone but herself. So when her family and Pete slowly but steadily start pushing her in the direction of baby making she feels that maybe there is something wrong with her for not wanting to take care of another human being (just yet). Struggling with her feelings, Ellie sets up a blog titled "None in the oven" to get the sound advice of virtual strangers who are or have been in the same position she's in. 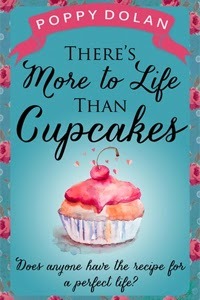 There's More to Life Than Cupcakes was a brilliant read! It was so nice and refreshing to be reading a women's fiction novel that didn't centre on romantic escapades, but instead on another important aspect of the life of someone in their 30s, the ever ticking biological clock and the expectations from those around you. Ellie was such a real character that as soon I opened the novel I felt like I had gained a new friend in her. Even though I'm not in a relationship myself and so the baby worries that consume Ellie's mind are not something that I am currently dealing with myself, her honesty about all the jumbled thoughts in her head became very real and relatable and I really felt for her as there was no right or wrong answer, only what would be right for her. The other characters were also great to read about, especially Pete who is the perfect caring husband but with his own struggles and doubts so he didn't turn into an unrealistic Prince Charming. And the heavy focus in the book on delicious baked goods (hence the title), Ellie works for a baking publication and she joins a weekly baking class to scope out a hot guy for her best friend, definitely appealed to The Great British Bake Off lover inside of me as well. I have no idea what teens do these days. I mean, I like Twitter and YouTube and One Direction. But I like to use all these things to better appreciate cute images of cats (if you haven't seen the Tumblr feed 'One Direction vs Kittens' then you're missing the WHOLE point of the Internet). Purchase There's More to Life than Cupcakes from Waterstones, Amazon.co.uk, Amazon.com or your own preferred retailer.